The graph depicts the change in the earth's atmospheric reflectivity per decade since 1980 as measured by a series of SBUV satellite instruments (Solar Backscatter UltraViolet) at a wavelength of 340 nano-meters. The units used, Reflectivity Units or RU, are equivalent to percent reflectivity on a scale of 0 to 100. The values shown in the graph are based on a quantity called the Lambert Equivalent Reflectivity (LER) normalized to noon conditions. LER at 340 nm is used, since at 340 nm the earths surface and vegetation are dark (about 2 to 4 RU) and nearly unchanging in areas without seasonal ice and snow. 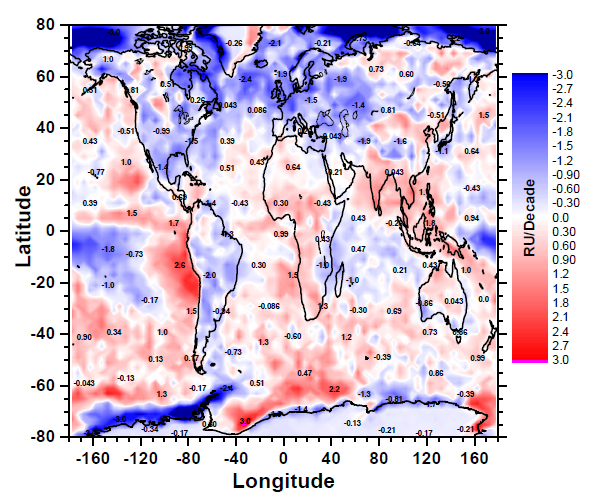 The result is that the observed changes mostly represent the change in atmospheric aerosols and clouds, which are much brighter than the Earths land or oceans. In ice covered areas, such as Greenland, the change represents both ice and clouds. The contour labels are turned on in Plot Details dialog, Colormap/Contours tab with the thermometer color palette. Herman, J., Matthew T. DeLand, Liang-Kang Huang, Gordon Labow, David Larko, Steven A. Lloyd, Jianping Mao, Wenhan Qin, Clark Weaver, A Net Decrease in the Earths Cloud Plus Aerosol Reflectivity During the Past 33 Years (1979-2011) and Increased Solar Heating at the Surface, Atmos Chem and Phys, 13(doi:10.5194/acp-13-1-2013), 21, 2013.